Get your WordPress website up and running in no time. Full theme installation and configuration. Security set up and configuration. 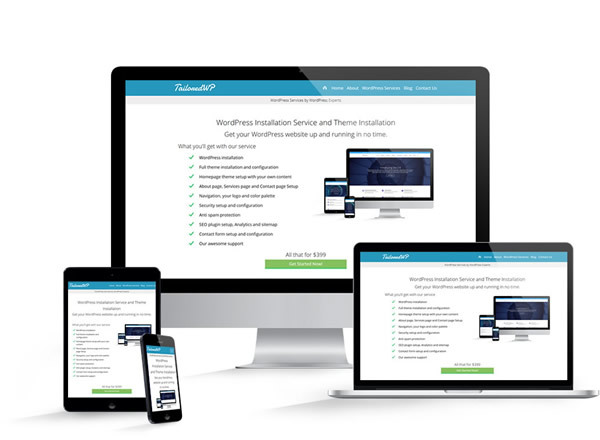 Looking for a WordPress Installation Service? Our WordPress service can help you designing a custom theme to gives you a quick and secure way of getting WordPress setup and your theme setup without hassle. We have created a service package that gives you everything you need to have your theme and your content setup in no time. Have you worked with WordPress and installed a theme before? You probably know that each theme has a huge learning curve, and they are becoming more complex by the day. Although they look great on the demo website, they don’t look like that when you install them yourself at home. You try to do it yourself and you get sidetracked and overwhelmed with a list of pending items longer than a CVS receipt. By the time you almost have it ready, you are two months behind your schedule. This means that you went two months without being able to promote your website and your business, two months without working on the more important aspect of your company: making money. Our mission is to deliver high-quality WordPress services that help our clients achieve their goals. WordPress setup is the first step. But you will also need security configuration, hosting, database, plugins, a theme, and customization. We follow WordPress best practices, especially in development and security to provide you with a top notch service. We recognize that it’s impossible to have a 100% secure website, but we try to make it harder to break and we help you to keep your investment safe. A lot of the theme setup services use demo content that comes with the theme. What you don’t know is that the demo content can be setup in just five minutes – ask any theme developer. Forget about that, because we will work with your content. We will put everything together for you so you don’t have to waste time editing it after the setup is done. The full WordPress theme setup usually takes from two to seven days or more depending on your theme and your requirements and how promptly you send us your information. We will install the most popular and the best plugins that will help you with a wide variety of features. We will install almost any free plugin like Contact Form 7, Really Simple Captcha, Social Media, Google Analytics, Growmap Anti Spam, all in one SEO pack and more. Need a particular plugin installed? Get in touch. We configure it with up to date SEO best practices and plugins already in place. That means your website is ready for search engine optimization by the time you start blogging and adding content. This will you ready for the next phase of SEO. Contact us for our ongoing WordPress SEO services that includes link building, keyword research and more. We will work with you until your page is up to your liking. But if we can’t deliver your website in a timely manner, we will give you a refund. We have more than 15 years of experience in web design and development and more than five years creating custom WordPress solutions. We have created hundreds of WordPress websites and blogs in different industries. We have customized themes and created custom themes and plugins. With us, you get the quality you deserve! We can install any theme, free or premium, it doesn't matter. We have installed hundreds of different themes. We recommend ElegantThemes and StudioPress Themes. I can't thank Ricardo enough. I had another developer drop the ball on putting together my main website in prep for a large conference I was attending as a speaker. He fixed all the problems, made it look a ton better, was super responsive and a fair fee to boot. I HIGHLY recommend Ricardo. There's a bunch of lazy people in this space that want to make a quick buck and move on to the next - Ricardo isn't one of them. Tailored WP re-built our multi-page website, promptly and efficiently, including several customizations. Ricardo Nunez moved our website from our self-hosting to WP 3rd party hosting, and delivered on-time. We continue to rely on Tailored WP's comprehensive service for our website management. Tailored WP saved the day. After hiring three web designers who wasted my money and my time, I finally asked ThemeFusion for a recommendation and was directed to one who knew how to code: Tailored WP is the best, most professional, and easiest to work with. What plugins do I get? We can install any plugins like Contact Form 7, Growmap Anti Spam, All in one SEO pack, Google Analytics and XML Sitemaps. If you need a particular plugin, let us know. For most services unless stated otherwise, the payment terms are 80% in advance and 20% after the job is complete. For some services you may need to pay in advance. Can I use any hosting company? Yes, as long as the hosting company covers the WordPress server requirements. We can also host your website. No coding is included. Should you need more information about custom development costs, please get in touch. Can you help me setup more pages? Yes, we can help you setup as many pages as you need. The price per page starts at $20 and it depends on the complexity of the page design and if it requires custom development. We offer volume discounts. We will start working based on your requirements. After we finish the first draft, we send it to you for a revision round. You’ll review it and create a list of changes that you want; these changes can include major layout modifications. After we make the changes based on your revision list, you will have a final revision round. After that second revision round is complete, we will only perform small tweaks and fix mistakes and problems, but no major layout modifications will be performed. If you can't find what you are looking for or need something special for your website, send us a quick message and we will be happy to assist you. Gutenberg: All About The New WordPress Editor!